Mills don't grind if you given them no water. 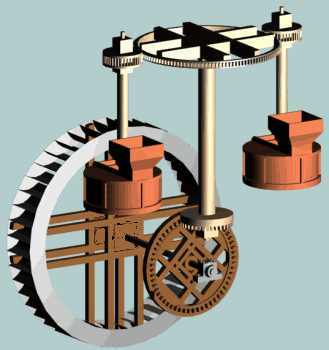 The original gear of the undershot waterwheel is almost kept as it was constructed. The pit wheel on the horizontal shaft is connected up to the wooden gear of the wallower. This is the gear on the vertical shaft, the so-called royal shaft. This way of gearing via the royal shaft is a peculiarity; in watermills the millstones are usually driven directly from the bottom, and not as in windmills from the top. 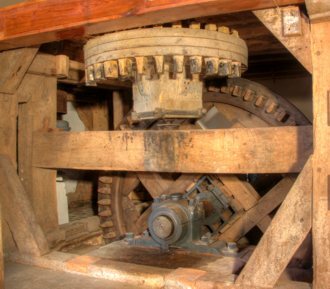 Why this way of gear is used in the monastery mill at Heiligenrode, is not known. A small film (ca. 2MB) will show you the Function of the royal shaft.